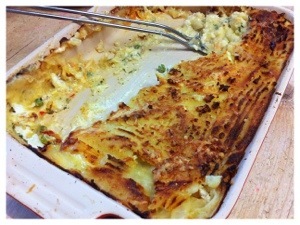 Been wanting to make a fish pie for ages & having never actually made my own, I decided today was the day. 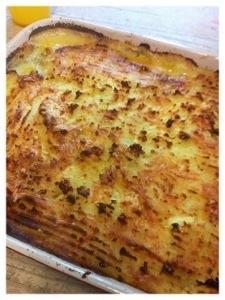 Craving proper comfort food! I am a member of a lovely cookery group on Facebook & got some tips on there, whilst loosely following a Jamie Oliver recipe. Fresh or frozen spinach – I defrosted two lumps! Peel & cut potatoes, put in pan salted water to boil for mashing. In separate pan, start boiling eggs. Put butter in saucepan, put in onions & celery, gently softening for a few minutes. Meanwhile, butter dish & grate in carrot & cheddar, add chopped fish chunks, drizzle with a squeeze of fresh lemon, add tub creme fraiche, pinch of salt, white pepper, chilli, chopped parsley, grated nutmeg, crumble stock cube, mix all together gently. Add frozen peas & dot with spinach. When eggs boiled, cool them in cold water, peel & quarter eggs & place over top. When potatoes are done, drain & mash using drizzle of olive oil/butter & season. Cover pie & sprinkle with additional grated cheddar. 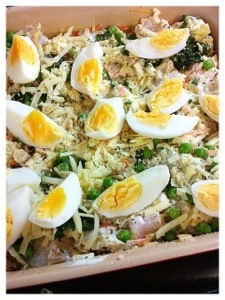 Cook in oven for around 45 minutes or until golden & bubbling. We chose to serve ours with extra peas. It was a big hit with our family – it should serve 6. We had two very hungry adults, two hungry older children & two little ones & polished off the whole lot!